I love reading. I love reading to myself and I love reading to my kids. Because of this I am always on the lookout for a good new book. A friend of ours who blogs over at The Doctor`s Wife has introduced me to every one of my new favorite children’s books. One such set that is Little Pea, Little Oink, and Little Hoot. Each of these books are about children not wanting to do something their parents want them to do. For example Little Hoot`s Mama and Papa want him to stay up late like a good respectable owl. Little Hoot on the other hand wants to go to bed early. On one page Little Hoot makes a promise to himself, when he grows up he will let his children go to bed as early as they want. The books are very cute and they remind me of all the child rearing promises I muttered to myself before I became a parent. Truth be told a lot of them had to do with video games. Growing up I loved playing games. A habit I have not gotten out of, nor plan too. Looking back I still remember feeling very annoyed when I was told that it was time to stop playing immediately because either a) the amount of unspecified time I was allotted to playing games had run out or b) some other event required my attention had started, like supper being ready. To be clear the problem wasn’t t the stopping. The problem was the immediately. I hated shutting my game off in the middle of the level, or in between save points. Turing the game off immediately meant I lost whatever progress I had made since I earned my last passcode, or since the last time I was able to save. To my folks this seemed silly. it was just a game. To me it mattered a lot. It was time I spent and achievements I had earned. Now when I am on the ball I try to let Simeon know that the his video game time is coming to an end with a 15 minute warning. But there are other times when such a count down is either forgotten or otherwise not possible. Suddenly there I am telling my son that game time is over and he has to do something else immediately There I am telling him that he can’t finish the castle in Mario even though I know if I give him 10-20 more minutes he can save his game. There I am, the very same person who in his early 20’s got home from church, fired up his Playstation and gamed until bed.There I am, the parent who is longing for his children to go to bed with the hope that his wife has a new book to read so he can log a few hours with his Xbox 360. There I am telling my mini-gamer of a son that he has to be all done NOW or I will take his Wii/DS away for a few days. Life is funny like that I guess. I could not avoid becoming the person that I muttered against. I am sorry little Christopher when you grew up you you were not always able to let your children finish the level. 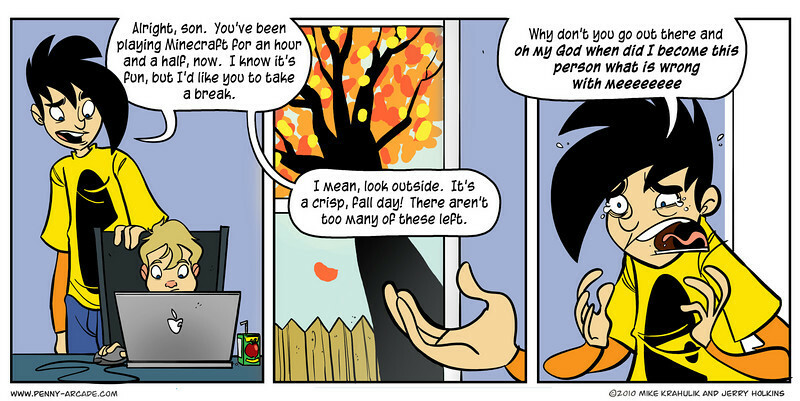 Thank you Penny Arcade for making this point so clear. I think it is definitely a perspective thing. As children we couldn’t believe our parents DID NOT UNDERSTAND! Finishing the game was SO IMPORTANT. But now as parents, we see a much larger picture. We are organizing our day and have appointments and time constraints and know that sometimes our kids will be better to put the game away right away instead of waiting. It is a lot like God that way. How often do we feel like we know the answer to everything and try to fight God when He wants us to do something different, forgetting that He has the bigger picture we lack? That is a great perspective on this Laura. I have found becoming a parent has greatly shaped my understanding of my own parents, and my walk with God. I sadly see myself acting as the stubborn child far too often when God is leading. i think this is so relevant for my future family- my hubby LOVES gaming (LOL, WoW even Minecraft) and we have decided, together, that once we had a baby we would shut off the cable, the gaming… all gone. for myself, around supper time, it was always the irritation with my parents that they insisted that we shut off the tv no matter what was on when supper was on. Which meant the same for my parents (dad would have to get his weather info from the phone instead of via live at 5). But it didn’t take long to realize that supper time IS family time and I am so happy that my family sat down every day with zero distractions during supper time. It is great to sit down for meals with no electronic distractions. That is the rule at our house right now, and one I have been known to bend a little with my cell phone. Power to your huddy for making the decision to give up on gaming. I know I found myself for a while thinking that every game I bought would be my last one. But all and all it is just my hobby so as long as it does not interfere with the more important aspects of my life I decided I was in no need to unplug forever. My husband had his games before we had kids and (Shocker!) so did I. We were huge players of a MMORPG – and I played late into the night well into my pregnancy. Want to know what I have discovered? These things naturally slow down and go away when children are involved. I haven’t had the time or the energy to play a game like this since having Cameron. (That’s a bit of a lie. One Christmas break I got myself addicted to WoW again.) And Dan has found the same thing – though he has occasionally found some entertainment in a game after the kids go to bed. I think planning to turn these things off when you have kids is admirable, but maybe not necessary. And perhaps, like Christopher, these things can actually help you feel more like yourself when you’re in the throws of feeling overwhelmed by being a parent. This is a great point Laura. One behaviour I did have to consciously change was how late I would stay up. It was not unusual for me to game (or heck even watch TV) quite late into the night. When my kids started sleeping on a schedule and I had evenings mostly free again I had to remind myself that by 6:30/7 at least one of my kids will be up and they are going to what their dad both physically and mentally present. I couldn’t not justify staying up until 2am or 3am knowing I would be mostly useless in the morning. 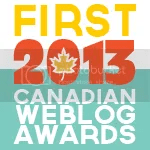 Very kind of you to mention my blog, since I am such a slacker and pretty much the most inconsistent blogger. I didn’t know that I am the supplier of all your favourite kids books! I am always on the lookout for good ones…. and by good ones, I mean ones that I find funny but still appeal to my kiddies. I have yet to experience the role reversal phenomenon, but I do think it’s in my near future once my girls get a bit older! You are, I think you have pointed me in the direction of every new favorite I have. Everything from the above mentioned books to Tadpole’s Promise, to This Is Not My Hat. They have all cracked me up. I am tempted to pick up ‘All My Friends Are Dead’ or maybe ‘Monsters Eat Whiny Children’. It is such a weird feeling to be in the position where you are basically saying things to your kids your parents said to you as a kid, and they are saying things to you that you said to your parents when you were a kid.